Wednesday’s NYTimes editorial on Oscar Pistorius was a truly eye-opening experience for me [when I read it Wed; I’ve been thinking about it ever since]. I’d been completely ignorant of the situation prior to reading the article. And dang am I excited about the prospects. (IMHO) What’s the most important take away? For me, it was the realization that the current attitude toward people with disabilities is very similar to the bigoted position we Americans found ourselves during the ‘50s, 60‘s and 70′s (not that the situation is completely better). Specifically, the attidute that someone with a disablity, where science & engineering has been able to overcome that disablity, competing with “normal” able-bodied individuals would tarnish and degrade the sport is unbelievably intolerable. 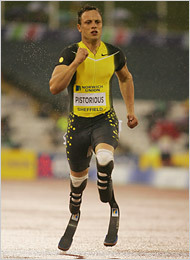 The controversy surrounding whether Mr. Pistorius is giving himself an advantage is an important one for maintaing a semblance of parity on the competitive field but let’s not get carried away in our attempt at protecting the ‘Spirit of Competition’ by keeping some of humanity’s best engineering accomplishments out of competitions because it “dirties” a sport. I agree complete with Selene Roberts that this is an inspirational story and Mr. Pistorius would inspire a lot of people by competing in the ’08 Olympics in Beijing. “There’s not one runner in the world that would give up his legs to have what this runner does,” said Casey Martin. (Casey Martin for you not in the know–I certainly was unaware–established a precedence at PGA tours for using a golf cart becuase a birth defect causing poor circulation to his legs while able to compete at golf was unable to walk an entire 18 holes). I think that about puts it right out there: nobody–and I do mean nobody–would trade in a set of legs for a set of cheetahs. I’ve made jokes about bionic parts integrating with the human body but the assumption with my whimsical fantasy is that I’m still made of human flesh with warm blood pumping through my veins. I think we’ll all know when scicence and engineering get us to the point of looking like Borg.